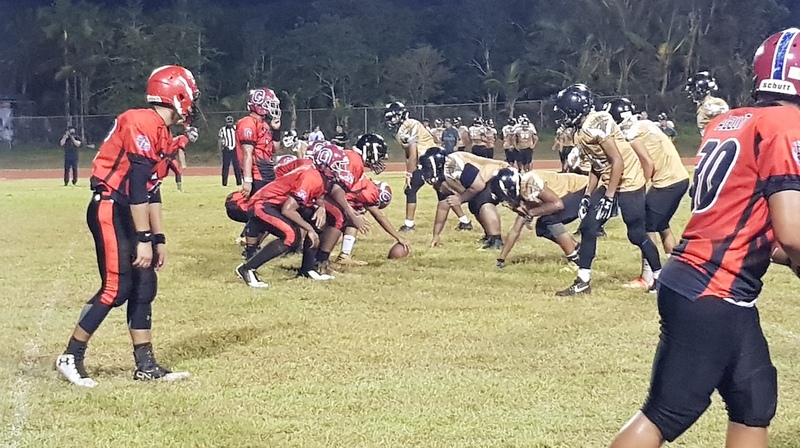 The JFK Islanders picked up a regular season finale win over the Okkodo Bulldogs Saturday evening as Okkodo celebrated their homecoming. A balanced Islander attack proved hard to stop as JFK posted a 34-12 victory, led by quarterback Andrew Perez over his former team in Okkodo. Perez tossed two touchdowns on the night amidst a handful of dropped passes from his targets. Perez started his high school career quarterbacking for the Bulldogs by way of St. Paul before committing to JFK for his senior season. Perez’s first meeting against his former team was less emotional and more goal oriented with his current squad. “I took it as just another game on the schedule and I’m just thankful we came out with a ‘W’. Other than that, I think we had a good game today and we’re happy with how this one played out,” said Islander Andrew Perez. Islanders receiver/corner back Nico Velez and Bulldog corner Nicholas Panganiban were getting into a heated exchange in the second half after Panganiban swatted away a pass intended for Velez in the 3rd quarter. The two would trade barbs for the games remainder until Velez broke free from Panganiban for a 35-yard touchdown in the 4th quarter. JFK put up a score in the 1st quarter on a punch in from running back Justin Camacho to take a 7-0 lead and later added to it as freshman running back Jacoby Quinata scored from seven yards out early in the 2nd quarter to go up 14-0. The Bulldogs would answer on the ensuing possession as Damian Cruz connected with Ethan Sanchez for their first touchdown, but a missed PAT would leave the score 14-6. JFK immediately responded as Chase Spotanski plowed is way through the goal line to put JFK up 21-6. Perez would toss his touchdowns in the second half and the Bulldogs would find the end zone on the games final play as Cruz found a wide-open Sanchez from 12 yards. The JFK Islanders will face the Southern Dolphins in the playoffs opening round next weekend. Although JFK had defeated the Dolphins 28-0 in the season opener, quarterback Perez didn’t have enough practices in to get in on the Islanders first game. So at the very least for Andrew, seeing the Dolphins next week will be a first. “I’m just looking forward to it. Reading their defense is going to be key and seeing what they’re giving me. I’ll see if I have to change anything or stick with what coach gives me as far as our gameplan. It’s all about working hard from here on out,” said Perez. A final playoff schedule has not been decided, but GSPN will release the information as soon as it’s available.